Remington's R1 Enhanced Threaded Barrel .45 is ready for covert operations! 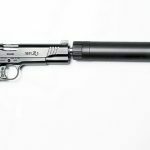 Remington’s 1911 R1 Enhanced Threaded Barrel is ready to accept a sound suppressor, like the AAC Ti-RANT shown, to deliver a stealth .45 ACP counterstrike. 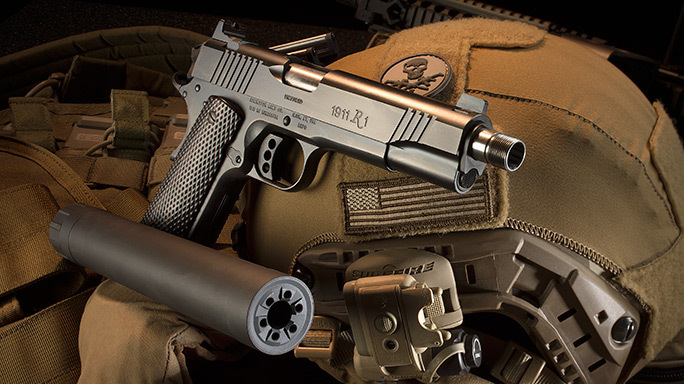 AAC’s .45-caliber Ti-RANT suppressor, with its Cerakote finish, adds 8.74 inches to the 1911’s overall length and 11.5 ounces to its weight. 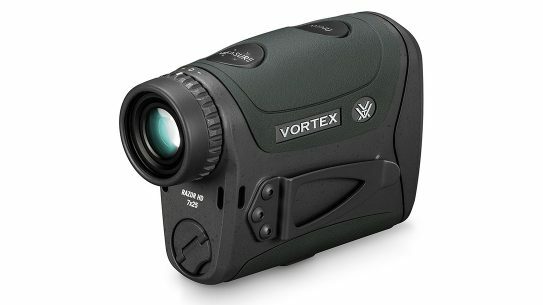 The front sight is serrated to reduce glare and features a tritium insert for fast targeting in low-light situations. 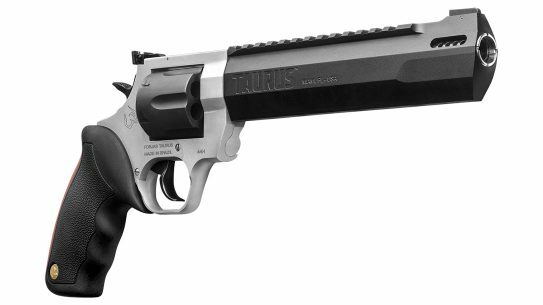 The 5-inch barrel sports .578-28 threading. The slide also features raised sights for targeting over the top of a suppressor. 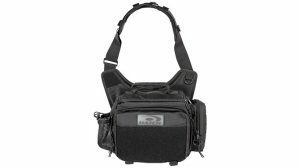 The pistol features a skeletonized hammer, a high-swept beavertail grip safety with a memory bump and checkered laminate grip panels. Throughout Remington’s 199-year history, Eli Remington and his sons gained their reputation by building military arms, and their business waned between conflicts. A true patriot, the elder Remington began increasing the factory size to meet production demands brought on by the Civil War, only to die and leave his sons to carry on his legacy. When the War Between the States ended, so did Remington’s fortunes. Marcellus Hartley recognized that the value of selling ammunition could complement the sporadic commerce afforded by selling long arms to the U.S. Army Ordnance Department, so he purchased the vestiges of Remington and combined the gun-making giant with United Metallic Cart-ridge (UMC). The invention and commercial success of smokeless powder and the creative genius of John Moses Browning intersected shortly after the dawn of the 20th century, at a time of global tumult and high demand for arms. When America entered World War I in 1918, 10,000 troops were joining the fight every day. To arm these men, arrays of small arms were manufactured in the preceding months. 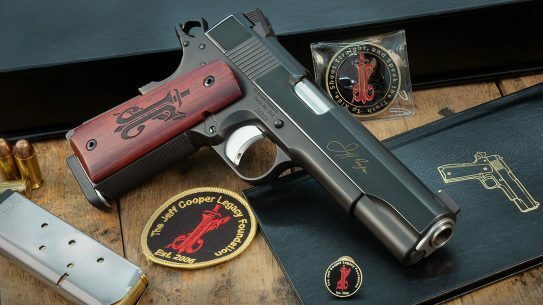 Included in the WWI military contracts, finally completed in 1925, were approximately 650,000 Model 1911 pistols. Approximately 21,676 Model 1911 pistols rolled off the lines in Remington’s Ilion, New York, plant before the Armistice in November 1918. Today, the Remington-UMC-marked pistols are sought-after collectibles. 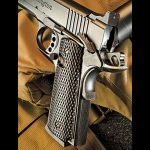 Ironically, Remington’s sell-off of its typewriter patents in 1886 created the office machine company that became Remington Rand, a manufacturer of World War II-era M1911A1 pistols. 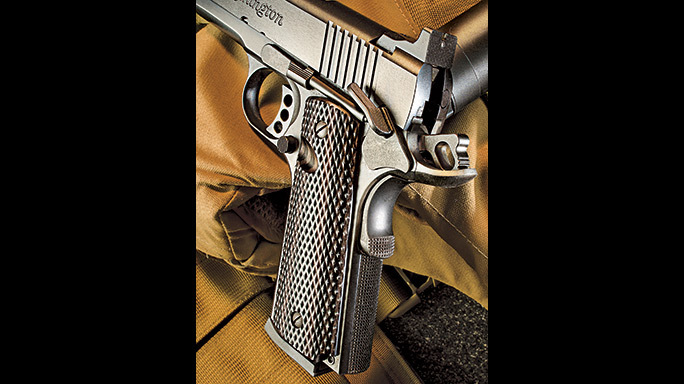 The advent of the Remington Model 1911 R1 brings the company full circle for manufacturing these pistols in its Ilion, New York, factory. 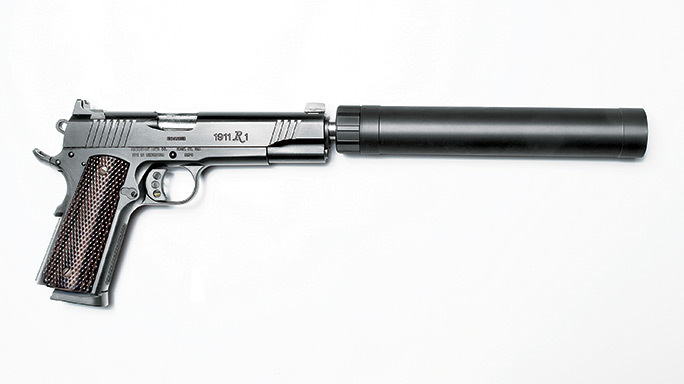 Following on the heels of the R1 was the R1 Enhanced model, which was then supplemented with the Enhanced Threaded Barrel, which, as its name implies, comes with a threaded barrel for attaching a sound suppressor. It also has a few features that set it apart in the R1 lineup, including taller sights and customized, fine-checkered grips. 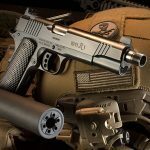 The new Model 1911 R1 Enhanced Threaded Barrel is a fine blend of machining craftsmanship and out-of-the-box performance made for some hard use. Every part of the R1 Enhanced Threaded Barrel .45 is produced with ultra-tight tolerances on equipment representing the height of modern technology. 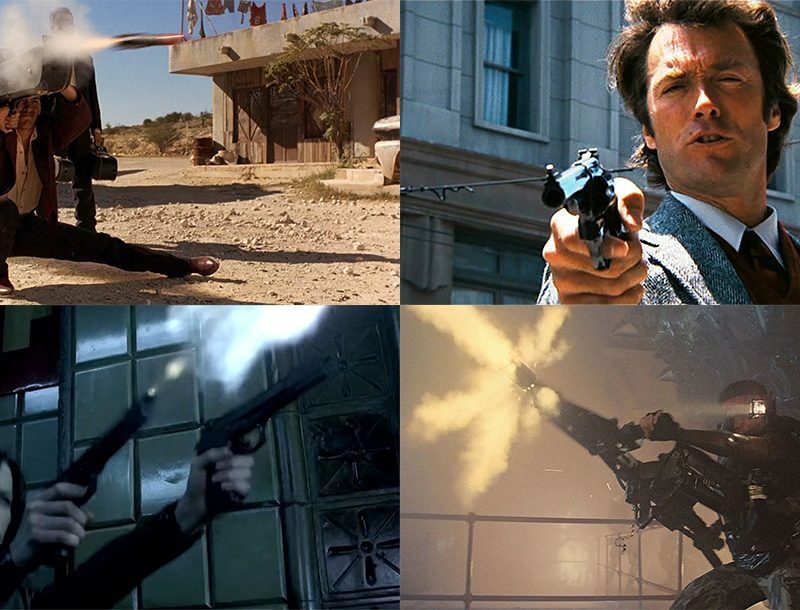 The result is a sweet-shooting advancement of a legendary design. 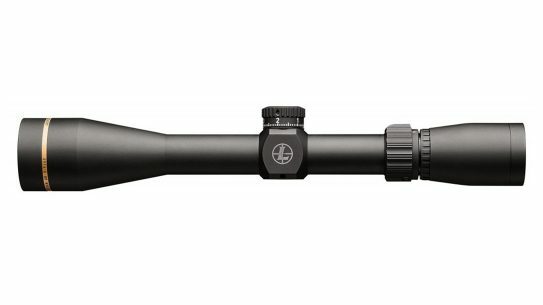 To set the R1 Enhanced Threaded Barrel apart from its siblings, it sports several refinements. 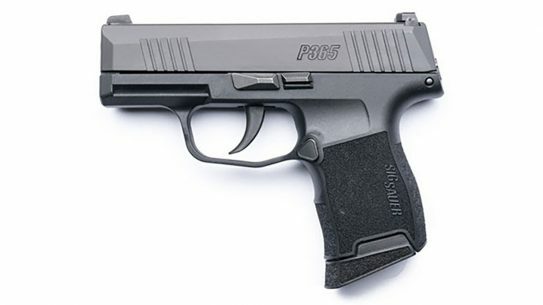 The first differences you’ll notice when handling the pistol are the extra-high front and rear sights. 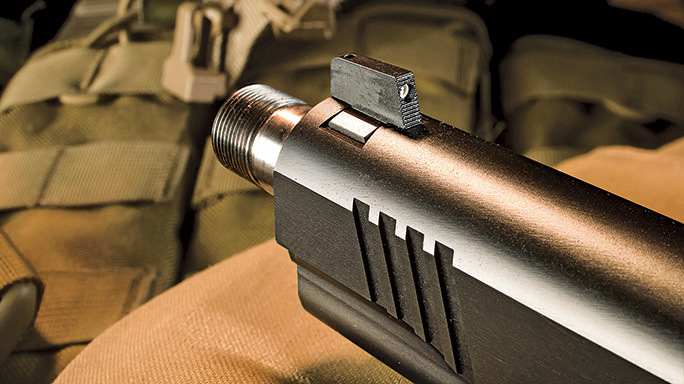 These sights are well built and capable of maintaining their zero with hard use. 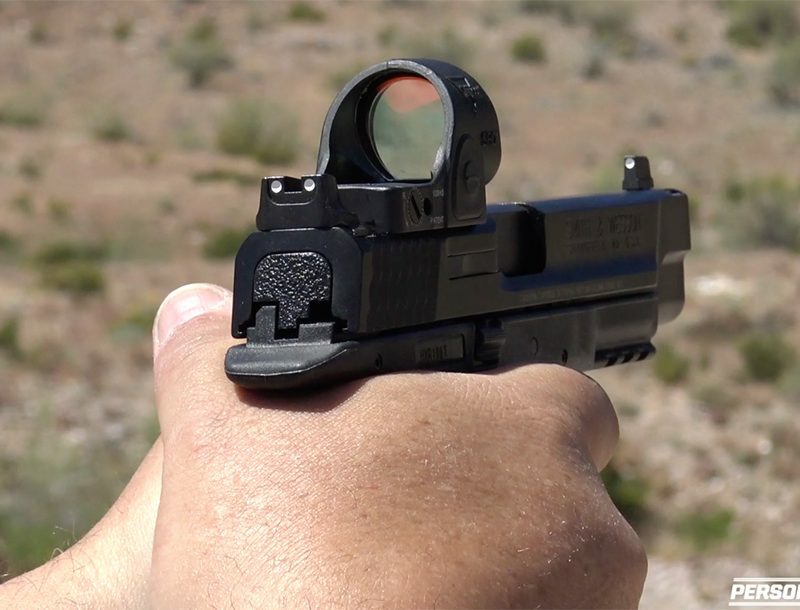 The sights are set up in a two-stacked-dot configuration for fast targeting. Also differing from a run-of-the-mill 1911 are the pistol’s front and rear slide serrations. These square-cut serrations have a forward slant that roughly matches the pistol’s grip angle. Care taken in the finishing process to not round off the edges of the broad serrations gives them a bold look and full functionality. 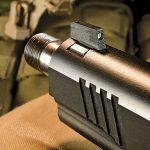 The rear portion of the ejection port also has had some metal relieved to improve ejection, and a small port on top that, when viewed from above, allows shooters to see if the chambered is loaded. 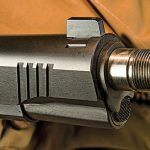 The grip safety is enhanced with a beavertail extension, and it has the nice added feature of what Remington calls a “checkered memory bump” that maintains the same 20-lines-per-inch (lpi) checkering on the mainspring housing. The frontstrap is serrated, and the wood laminate grip panels are checkered. The left-side panel features a thumb groove for a right-handed shooter. 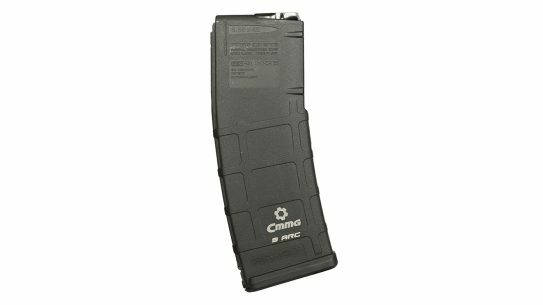 The R1 Enhanced Threaded Barrel pistol also has a beveled magazine well for fast reloads, and it comes from the factory with two 8-round magazines fitted with bumper pads. 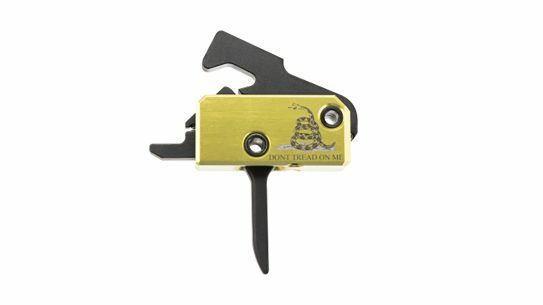 The anodized aluminum, match trigger is the extended type, and it’s also skeletonized to reduce weight. From the factory, the trigger breaks at 3.5 pounds with a small amount of creep and overtravel. The thumb safety is upgraded with a little more length and width, and it functions well for those with larger hands. The pistol also features a lightweight, skeletonized hammer. 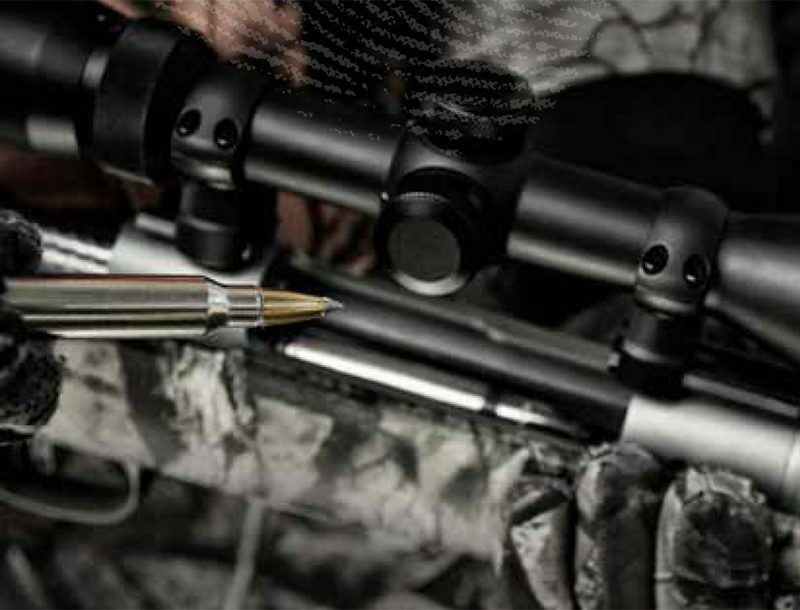 At the heart of every good pistol is a good barrel, and the R1 Enhanced Threaded Barrel features a match-grade, stainless steel barrel that is 5 inches long. It’s held in place with a stainless steel bushing. Again, the barrel is threaded, and it comes with a thread protector. The fit and finish of the R1 Enhanced Threaded Barrel is on par with many custom Model 1911s I’ve tested, and the final finish was better than that on other R1s I have handled. At the range, I tested the R1 Enhanced Threaded Barrel’s accuracy by shooting five-round groups with nine factory loads at 25 yards. I went beyond the norm and shot five groups with the factory loads and added a favorite plinking handload. I fired from a sandbag rest on a solid bench. 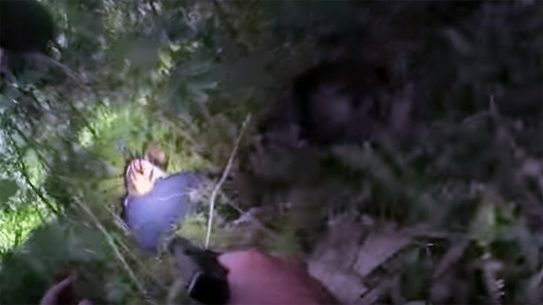 Over the years, I have learned that a 1911 with a good trigger and open sights from a solid Ransom rest will produce groups approximately half of what I can average shooting from a good sandbag rest at 25 yards. An Oehler 35P chronograph recorded the velocity data. To yield an adequate evaluation, I mounted an Advanced Armament Corporation (AAC) Ti-RANT sound suppressor. First up were Black Hills’ 230-grain jacketed hollow points (JHPs). 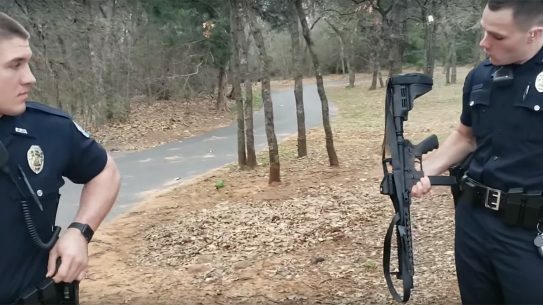 Their velocity averaged 820 fps, and the smallest five-shot group measured 4.3 inches. Remington provided four loads for testing. 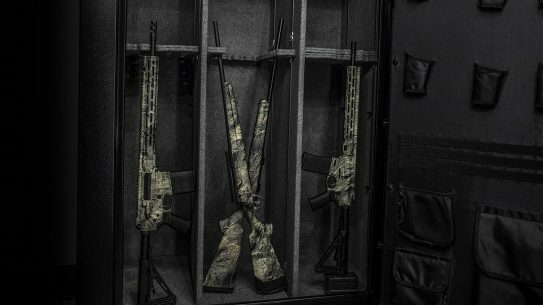 The Express loads, weighing 185 and 230 grains, averaged 1,086 and 814 fps, respectively. The faster load produced a best group of 3.2 inches, while the slower, heavier load averaged 814 fps and printed a 4.4-inch group as its smallest. Golden Saber brass JHPs weighing 185 and 230 grains averaged 1,028 and 832 fps, respectively. 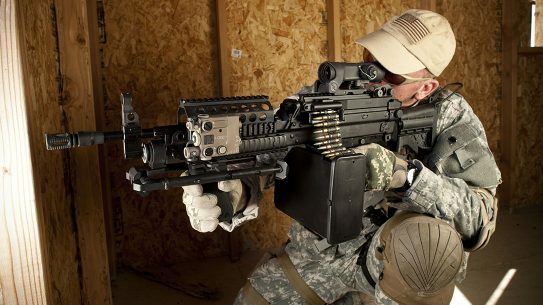 The faster load produced a 3.5-inch group, and the other load’s best group measured 3.9 inches. Federal’s American Eagle “economy” 230-grain FMJs averaged 830 fps. The tightest group measured 2.9 inches center to center. The other 230-grain FMJ load was PMC’s, which averaged 820 fps and produced a 4-inch group. I also tested Winchester’s PDX1 230-grain JHPs and Hornady’s Critical Defense 200-grain XTPs. The Winchester load produced a 3.6-inch group and averaged 948 fps. 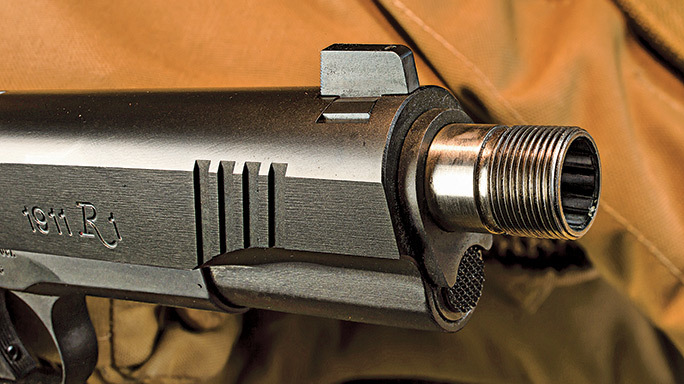 Hornady’s load produced a 3.2-inch group and traveled downrange at an average of 902 fps. 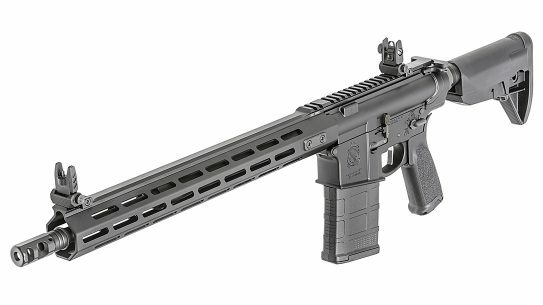 The R1 Enhanced Threaded Barrel boasts enough upgrades to satisfy most shooters, and the capability to attach suppressors promises quiet, fun shooting. 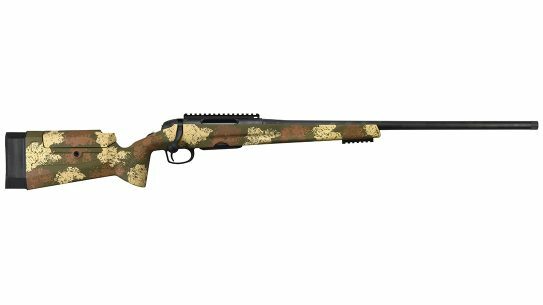 Its accuracy is noteworthy, and it’s certainly worth the $1,140 price tag.